"Carole Nelson Douglas has written a wonderful second Street urban fantasy... Delilah discovers a new power which enables her to walk through mirrors into other realms where she interacts with the inhabitants. Readers will remain drawn to her even as she still is an enigma. Fans will hope she and her cronies to include normal vampires (duh--I cannot believe I used the word 'normal') can defeat the enemy. 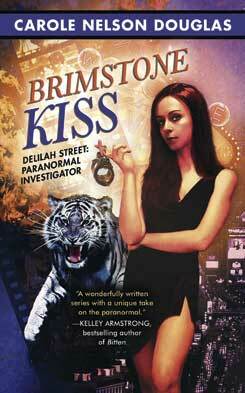 Brimstone Kiss is a magical mystery fantasy tour." "...This is the second installment in the Delilah Street, Paranormal Investigator series and it's as enjoyable as the first. Carole Nelson Douglas centers much of the action on a decades old mystery that comes together piece by intriguing piece. Brimstone Kiss has all of the dark, dangerous, and unique paranormal elements readers seek, along with the passion, love and exciting temptations that add spice to the mix. Much of the secondary mysteries continue with an ending that will have me eagerly awaiting the next release, but in the meantime I'd be more than happy to read this keeper a second time." Carole Nelson Douglas, author of more than fifty fantasy and science fiction, mystery, mainstream, and romance novels, was an award-winning reporter and editor for the St. Paul Pioneer Press. After writing some bestselling high fantasy novels and SF thrillers, she imported fantasy notions into her Midnight Louie mystery series, which features a hard-boiled Las Vegas PI who's a feline "Sam Spade with hairballs." Her Irene Adler historical series made Carole the first author to use a woman from the Sherlock Holmes stories as a protagonist in the 1991 New York Times Notable Book of the Year, Good Night, Mr. Holmes. She's won or been short-listed for more than fifty writing awards in nonfiction, sf/fantasy, mystery, and romance genres, including several from the Romance Writers of America and Romantic Times BOOKreviews magazine, and the Cat Writers' Association. 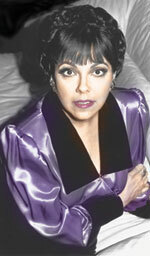 In 2008, RT BOOKreviews magazine named Carole a "pioneer of the publishing industry." Carole and husband Sam Douglas, a former art museum exhibitions director and kaleidoscope designer, are kept as pets by five stray cats and a dog in Fort Worth, Texas. She collects vintage clothing, does a mean Marilyn Monroe impersonation, and, yes, she does dance, but not with werewolves. As far as she knows. Email Carole at cdouglas@catwriter.com, and find out more about her books at www.carolenelsondouglas.com and www.delilahstreet.com.